It marks his 15th major title and his first since 2008. The last time he won the Masters was 14 years ago, in 2005. Not since the 200 8 U.S. Open had Woods hoisted a major trophy while the last of his four Augusta titles came in 2005, his fifth Green Jacket leaving him one short of another Nicklaus record. The victory also marked the first time Woods had reached the winner's circle at major without leading after 54 holes. Overnight leader Francesco Molinari title charge collapsed with two double bogeys. It comes more than two decades after his first win at Augusta National at the age of 21 – and follows a decade-long period in the wilderness marked by personal scandal and injury that put him out of the game. "It's overwhelming, and I think it's because of what has transpired, and last year I was just very lucky to be playing again," Tiger Woods said afterwards. "To now be the champion, 22 years I think between events is a long time!" In 2009 Tiger Woods suffered a dramatic fall from grace when a turbulent private life was revealed. After he crashed his car outside his Florida home came revelations of infidelity. He admitted cheating on his wife Elin Nordegren and made a fulsome apology, however it did not prevent his marriage from ending the following year. Woods' public persona plunged: from a sporting icon, he became the subject of many a comedian's jokes. Afterwards, injury plagued his comeback attempts. Severe back problems kept Woods out of the game in recent years. He's had four operations since 2014, having complained of being barely able to walk before the surgery. As recently as 2017 his world ranking had plunged to nearly 1,200. Now he is back up to number six. The same year, the golfer was back in the news again when he was found asleep at the wheel of his car, and later pleaded guilty to reckless driving. Five prescription drugs were found in his system, the result of his attempts to recover from back surgery. Tiger Woods' achievement brought a rare display of unity from U.S. President Donald Trump and his predecessor Barack Obama. Trump tweeted to say: "Love people who are great under pressure. What a fantastic life comeback for a really great guy!" Obama said on Twitter: "Congratulations, Tiger! To come back and win the Masters after all the highs and lows is a testament to excellence, grit and determination." 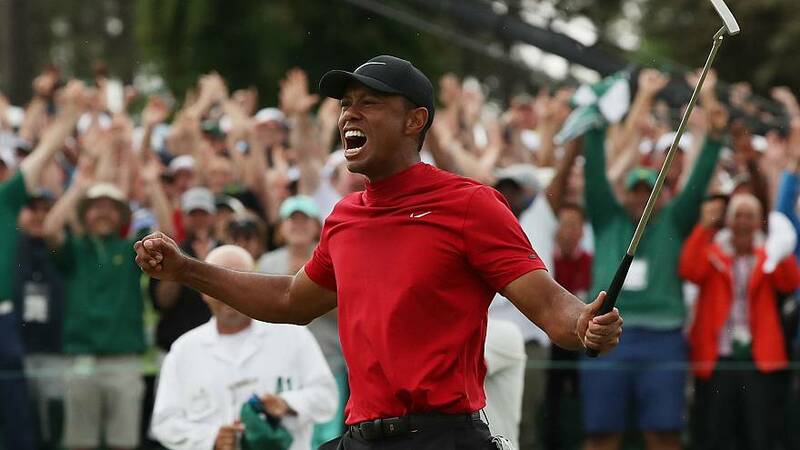 Jack Nicklaus – whose tally of 18 major titles is three ahead of Woods – tweeted: "A big 'well done' from me to Tiger Woods! I am so happy for him and for the game of golf. This is just fantastic!!!"